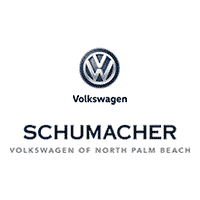 Schumacher VW of North Palm Beach has proudly served the Palm Beaches for over 45 years as a highly respected, family owned business that carries some of the most popular names in the automotive industry.Schumacher VW of North Palm Beach strives through the hard work and sincere commitment of their team of over 800 employees to provide the best automotive shopping experience available. Our mission is to “Serve Customers for Life”. Commitment to our customers and providing quality service is evident in our world class state of the art facilities, great selection of products, and the finest employees in the industry. We have a strong and committed sales staff with many years of experience satisfying our customers’ needs. Feel free to browse our inventory online, request more information about vehicles, set up a test drive or inquire about financing and available VW lease deals and specials! And if your vehicle needs service? Schedule an appointment at our VW service center, and don’t forget to check out the available service coupons.